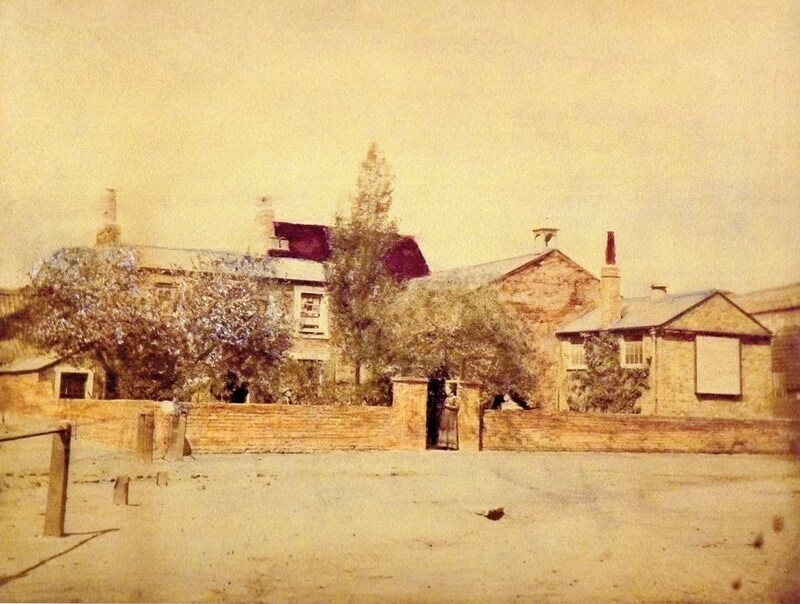 Stephen Lyne sent this rare photo of the school buildings in The Ham, which he believes may date to the retirement of John Lyne the school master in 1884. 'It's a copy but the colors are as original. 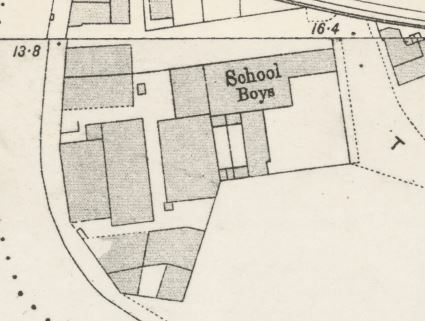 The out line of the buildings is as the 1894 ordnance survey map and the arch on the bridge is in the photo, it's before the school was rebuilt in 1905'. Brentford Past by Gillian Clegg provides a history of this school. Faulkner (1845) also provides a history: in 'the school room capable of containing two hundred boys' was built in 1815 (or 1818 - histories vary) costing £1,028 - raised by subscription -on land held by Colonel Clitherow. It became a National School for boys in 1835 (for Church of England pupils, in contrast to British Schools which served non-conformists). If you do not know Brentford, The Ham is at the bottom left of Bacon's map of 1925 and three earlier maps below show the school outline. A list of masters is included after the images. There are two figures in the photo: a man wearing a hat to the left of the gate and a lady standing in the gateway. The site has a 1997 photo showing a later extension built in 1905. The first map to the left is reproduced courtesy of Corporation of London, London Metropolitan Archives. 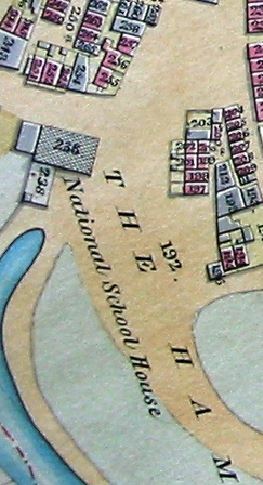 It shows the school building (hashed) and adjoining schoolhouse ca 1838 (New Brentford tithe map). It is difficult to imagine 200 pupils fitting in. The 6” to the mile OS map from 1864/5 (below left) shows a different outline for the enlarged buildings, suggesting the eastern ‘wing’ was added between then and 1893. The railway to Brentford Dock is visible cutting across The Ham just north of the school. 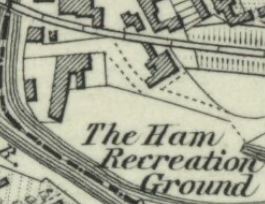 The map below is an Ordnance Survey map of 1893 and shows the new extension visible in the photo. The photographer was standing somewhere near the 'T' on the map.